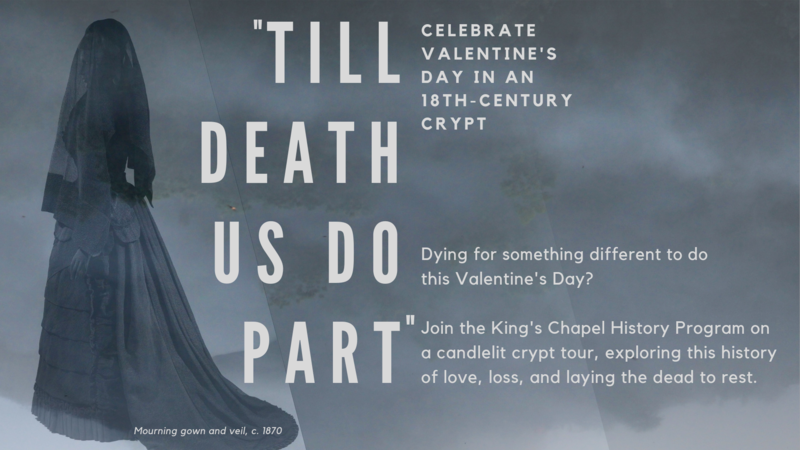 If you're dying for something different to do this Valentine's Day, join the King's Chapel History Program on a candlelit crypt tour, exploring the history of love, loss, and laying the dead to rest! Would you wear jewelry made from your deceased loved one's hair? Would you consider preparing their body yourself and hosting the wake in your living room? Uncover the history of American mourning traditions, funeral customs, and burial practices as they relate to the loss of a loved one throughout Boston's history. Explore the crypt beneath King's Chapel, walking among the 21 tombs, and discover the stories of the historic people and couples laid to rest within them. Tours offered at 5:30 PM and 6:30 PM on February 1, 2, 3, 4, 8, 9, 10, 11, 12, 14, 15, 16, 17, and 18. ​$10 per person. Advance tickets required.